I‘m sorry. I really am. I’m about to tell you not to live another hour without reading this novel, and you’re never going to find it. 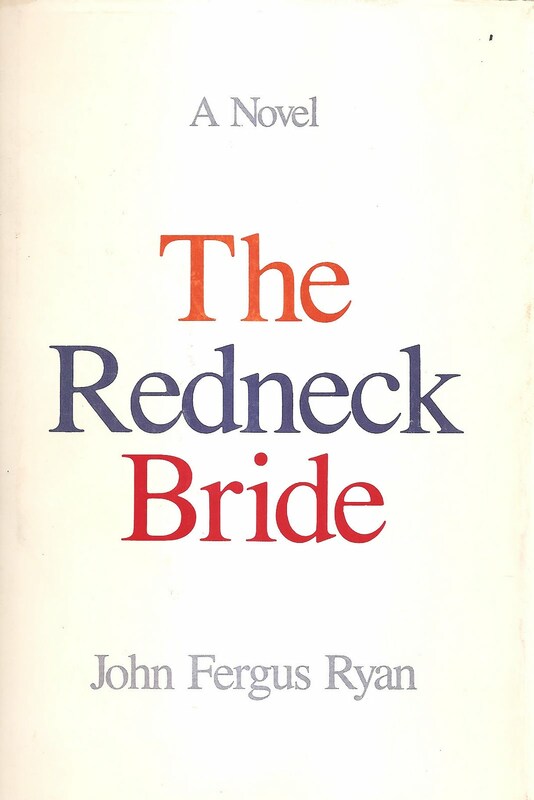 The Redneck Bride by John Fergus Ryan is pure southern Gothic, out of print and mighty scarce. I got lucky. This book (literally) lept off the shelf and into my hands in the used book basement at the Cox Creative Center the other day. I caught it before it hit the floor and – call me crazy – I’m convinced Ryan’s rapscallion ghost was responsible. Probably smoking contraband cigars in the afterlife, right there in the basement. I don’t blame the haint – the book was misshelved in with the general fiction population rather than the special “Southern Lit” or “Arkansas” shelves. Five dollars later, I had a first edition hardback filled with illustrations and wearing a pristine dust jacket. Don’t look for this to be Faulknerian. The Redneck Bride‘s narrator has poetic Attention Deficit Disorder, with a healthy dose of descriptive OCD – that’s part of its charm. But the one-liners hit hard. Sometimes hard enough to put the book down and walk away for a minute just to catch your breath. Some years ago, Billy Bob Thornton attempted to produce a movie based on the book. No amount of research has turned up what happened to the project, and Billy Bob hasn’t yet returned my call/tweet. Ryan’s novel The Little Brothers of St. Mortimer did make it, but straight to DVD. It’s called The White River Kid and has quite a cast of stars. His novel Watching came out in 1998 and it looks like I’m going to have one hell of a time finding any copies of that one. Sadly, John Fergus Ryan died in 2003. His obituary in the Memphis Flyer, eloquently written by Jackson Baker, is worth reading start to finish, especially the section on his writing process. In fact, someone out there needs to write Ryan’s life. His son, John Jr., illustrated The Redneck Bride, and I understand makes his living as an artist. Strangely enough, both father and son appeared in the film The People vs. Larry Flynt. Ryan Sr. was a firecracker for sure. You know, I might just head to President Clinton Avenue and crawl back down into the used book basement again. Maybe ol’ John will sling another one out of the shelf for me. It could happen. That is really a cool way to get a book. I believe in ghosts and I'm willing to bet that's who pushed the book at you. I've had my own gems discovered in used book stores or at yardsales that also were out of print. Good luck in your search. Perhaps one search might be seen by the publisher… It could happen. Southern Literature is my very favorite genre. I'll have to see if I can find that one. Maybe you could send the ghost my way. I got my first copy of Rebecca at a yard sale, and I have no idea why I picked it up. I am completely hooked for Daphne DuMaurier now. I love stories about how people find their favorite authors. and then to be assisted!! Great story about how you came by the book. Now that I'm intrigued, I've just checked and sure enough the Central Ark. Library System has 5 copies. So at least those of us in Central Ark. can get our hands on a copy to borrow! Good lord, Sandy. I don't think there are that many copies ANYWHERE else. Maybe Memphis, I don't know. I just checked the UCA library – we've got a copy on the shelf and one in the Archives. YES. I LOVE the idea of 'the hunt' for this book, but, alas, I gave in to instant gratification, contacted Amazon.com, found several copies and one is winging it's way to me even as I write this! Thanks for suggesting it; can't wait! Corey, thanks for the link. These books are almost impossible to find. Donna, you crazy thing. I'm so glad you found a copy of this bizarre book.